Also, note the Satellite of Love from MST3K made it # 9! Thanks for the heads up, riversfeet! ''Prometheus'' cruises at the multiplex, but is it the smoothest ride for a galaxy quest? See our ranking! 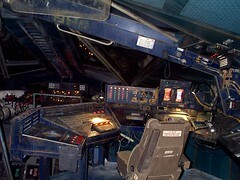 Coolest Feature: Like many of the vessels on this list, the Serenity is a piece of junk. But it's a dependable piece of junk, with character to burn. 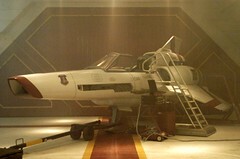 The niftiest aspect of the Serenity is the pair of smaller shuttles that can detach from the main body of the vessel, one of which is leased as a living space by glamorous Companion Inara. I saw Prometheus recently. There is a scene where the spaceship from Earth lands. It is quite a beautiful ship and it also resembles the Firefly ship Serenity. This new ship had four engines instead of two but the layout was similar. This is stretching it a bit but I also thought it was interesting that as in the film Serenity, the spaceship of the Engineers was a rather nasty, non-ship looking ship. So were the the ships of the Alliance in Firefly and of course there were the nasty looking rides of the Reavers. The design of the Engineers ship is purely functional, without appeal, and certainly not as interesting or attractive as the ship from Earth. I don't think it was intentional or that there is a trope implicit in this. Rather, I think that both films choose to make the point that the technology belonging to the villains often looks evil and menacing. Lee Stringer, ex-CG Sup/Digital Artist on Firefly and Serenity, has posted a series of Firefly set images on his Flickr page. Fans of Battlestar Galactica (and Katee Sackhoff) will love these pictures : Old renders and pictures from the new Battlestar Galactica Series. We first showed you a sneak peek at this stellar Serenity scale model from Joss Whedon's Firefly, and now that prototype has become a reality. We're totally spaced out over this ravishing film-scale replica, crafted from more than 250 laser-cut parts and finished to sublime perfection by the brilliant artists at QMX. This beauty is a looker from any angle and is an exact replica of the 1: 124 scale 3D cinematic model of Captain Mal's elegant star cruiser used for the 2005 feature film. To pre-order this impressive masterpiece visit the QMx site.